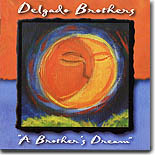 The Delgado Brothers are one of the most soulful bands I’ve ever heard. They’re hardly one of the most prolific bands in the biz, which explains why they’re not better known. A Brother’s Dream marks only their third release, following the wonderful self-titled 1987 Hightone debut and its follow-up, Let’s Get Back, released a dozen years later on Mocombo. There are moments that remind of Robert Cray, Santana, and even a taste here and there of War and Los Lobos. This is not indicative of a proclivity to emulate other musicians, but rather points to the quality of songwriting and superb musicianship that the bros. bring to the studio. This is a band loaded with heart, emotion and chops, and one that stands shoulder to shoulder with any of their left coast contemporaries. From the opening “Mama’s Crying,” with a musical motif that reminds of a cross between the Jeff Beck Group’s version of “Superstition” with “Voodoo Chile,” the brothers set the pace for a dozen tunes that by turn subtly rock and caress the soul. “Joy You Bring” (“...I didn’t know my soul could sing/thank you for the joy you bring...”) has a late-nite slow dance feel, while the cleverly titled “Lost In The Shuffle” is a slinky number that benefits from Juke Logan’s crisp tenor harp. The dance floor ready “Betty Sue Boogaloo” crosses a jazzy electric piano with a percussive back beat. This is not a band comfortable with a cliché. “Let’s Go” is a muscular piece that utilizes the sort of medium tempo, dramatic, guitar-fueled groove that works so well for Robert Cray. The album is a success on a number of levels. The songwriting and performances are, of course, the gold, but the production – the coaxing of those gorgeous sounds, and their arrangement on disc -- the juxtaposition of different tempos into a brilliantly constructed song-quilt, makes this one of the finest collections to kiss these ears yet this year. “Picture of You” has a quality of gentle strength, with delicate acoustic guitars, percussion and superb vocal interplay. Then comes the chunka-funk of “Do You See Me” that reminds of the great 70s jam band Stuff. “Jennie” is another sweet acoustic number that points to the split personality of the band. “In Step” is flat out '70s soul, and “Leave Me Alone” has a bit of that SRV loopy guitar groove. The closing “Talk To My Friend” is more soul with Steve Delgado’s riveting vocals buoyed by Joey Delgado’s guitar and Michael Thompson’s emotive piano. The sum is extraordinary, which speaks as well to the whole of this wholly enjoyable collection. Journeymen players all, this brotherly band is the epitome of a well meshed unit. My only complaint is that I lived in Southern California for a decade and never saw the brothers play live.